The muscles that bend or flex the fingers are found in the forearm and are called flexor muscles. The flexor muscles are able to move the fingers through cord-like extensions called tendons, which attach the muscle to bone. The tendons of the flexor muscles that lead to the fingers and thumb begin just beyond the middle of the forearm. second joints. The other tendon attaches to the bone at the tip of each finger on the palm side and bends all three finger joints. HOW ARE FLEXOR TENDONS INJURED? Deep cuts on the palm side of the wrist, hand, or fingers can injure the flexor tendons and nearby nerves and blood vessels. The injury may appear simple but it is actually more complex. When a tendon is cut, it acts like a rubber band and its cut ends pull away from each other. Because many cuts happen while the fingers are bent, the cut ends of the tendon move even further apart as the fingers are straightened. A tendon that has not been cut completely through may still allow the fingers to bend, but can cause pain or catching and may rupture. When both tendons are cut completely through, the finger joints cannot bend on their own. Tendons are made of living cells and connective tissue. If the cut ends of the tendon can be brought back together, healing begins through the cells inside as well as the tissue outside of the tendon. Because the cut ends of a tendon usually separate after an injury, it is not likely that a cut tendon will heal without surgery. Your doctor can advise you on how soon after surgery is needed after a flexor tendon is cut. There are many ways to repair a cut tendon, and certain types of cuts need a specific type of repair. After surgery and depending on the type of cut, the injured area can either be protected from movement or started on a very specific limited movement program for several weeks. If unprotected finger motion begins too soon, the tendon repair is likely to pull apart. After four to six weeks, the fingers are allowed to move slowly and without resistance. Healing takes place during the first three months after the repair. In most cases, full and normal movement of the injured area does not return after surgery. If it is hard to bend the finger using its own muscle power, it could mean that the repaired tendon has pulled apart or is bogged down in scar tissue. Scarring of the tendon repair is a normal part of the healing process. 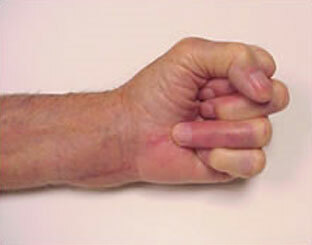 But in some cases, the scarring can make bending and straightening of the finger very difficult. Depending on the injury, your doctor may prescribe therapy to loosen up the scar tissue and prevent it from interfering with the finger’s movement. If therapy fails to improve motion, surgery to release scar tissue around the tendon may be required.